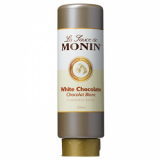 Monin White Chocolate (Chocolat Blanc in French) syrup in stylish 70cl glass bottle. Unlike 'chocolate' (i.e. milk chocolate or dark chocolate), the rich, buttery flavour of white chocolate is not derived from the cocoa bean itself, but from cocoa butter. The sweet, subtle flavour of white chocolate perfectly complements and enhances other flavours. Ideal for making mochas or enhancing hot, chilled or frozen lattes, cappuccinos, espressos, flavoured milkshakes, chocolates. 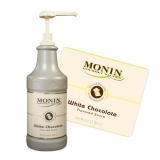 Monin White Chocolate will please all. Applications: CCoffees, cocktails, dessert drinks, milkshakes. Sugar, water, flavouring. 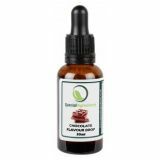 Contains cocoa extract.